Various Motorhome & Lesiure vehicles make up a large percentage of our Cruise Control installations. Modern Motorhome vehicles are now elecrtonically controlled and you may well have heard the term "CAN BUS", "CAN" or "Drive by Wire" ? All are terms that relate to the electronic control of your Motorhome. We have a range of Cruise Control kits that interface seemlessly with your vehicle regardless of how it operates. The most popular motorhome based vehicle we come across is the Fiat Ducato. This vehicle uses our AP900 Motorhome Cruise Control system with a dedicated pedal harness and the ever popular CM35 left handed stalk control as pictured below. The Fiat Ducato Motorhome offers a very nice home for the stalk control, just below the indicator stalk is a small recess where it sits perfectly. We are often asked "will I catch my knee on it?" Well, no you won't! The end result is a very covert and smart installtion that is incredibly relaible and benefits a 3 year warranty. Your Motorhome Cruise Control once fitted benefits from 2 memory presets which can be changed to suit your preference at any time. 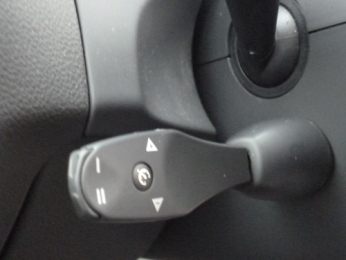 Once engaged the cruise control will maintain your vehciles speed however the CM35 Stalk can be used to increase or decrease the speed at any time. Should you require the use of the brakes or the clutch then the AP900 Cruise Control will immediately disengage from the throttle. Should you require further information about Cruise Control for Motorhomes and Campers fitted then please do not hesitate to contact us where we will be happy to discuss your requirements and answer any questions you may have.